10-Minute Plays for Kids is a collection of terrific plays for young thespians from veteran editor Lawrence Harbison, a man who has spent his career championing new and established playwrights by bringing their work into print. Included are some prominent playwrights such as Sharyn Rothstein, Alex Broun, Jenny Lyn Bader, Claudia I. Haas, and Mark Harvey Levine, and by others less well known but equally terrific such as Sharai Bohannon, Suzanne Bailie, and Shirley King. The characters and situations portrayed are perfect for the kid actor. Some of the plays explore relatable tales of friendship and family, while others allow the actors to take on the personas of nonhuman characters, such as fish and chess pieces! 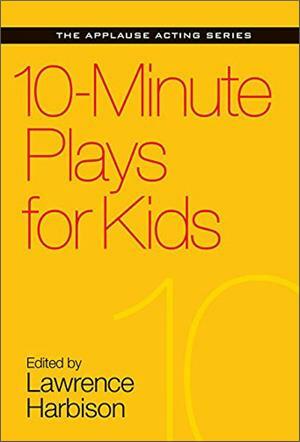 10-Minute Plays for Kids is ideal for theater students, youth groups, and acting classes. Lawrence Harbison is currently Senior Editor for Smith & Kraus, Inc. For over thirty years he was in charge of new play acquisition for Samuel French, Inc., where his work on behalf of playwrights resulted in the first publication of such subsequent luminaries as Jane Martin, Don Nigro, Tina Howe, Theresa Rebeck, José Rivera, William Mastrosimone, and Ken Ludwig, among many others. He is a member of the NYC press corps, the Drama Desk, and is an Outer Critics Circle member. He has served many times over the years as a judge and commentator for various national play contests and lectures regularly at colleges and universities.